“In the age of mega-institutions and competitive building, the Turkish novelist Orhan Pamuk pays homage to the more personal places, like his own Museum of Innocence, whose character and content evoke a deeper experience. My favorite museums tend to be small, the kind that showcase the inventiveness and the life stories of private individuals. Though I admire national museums like the Louvre or the British Museum, when I’m traveling and whenever I set foot in a new city, the first places I rush to see are not these institutions that fill me with a sense of the power of the state and of the history of its people, but those that will allow me to experience the private world and the vision of a passionate individual. I have so much respect for the efforts of those creative people who devoted the final decades of their lives to the task of turning their homes and their studios into museums for the public to visit after their deaths. These small museums are usually hidden on side streets just outside the center of large Western cities. They have the power to make us rediscover a feeling that the big national museums, looking more and more like fun-filled shopping malls with each passing day, can no longer make us feel, and that we have begun to forget. Museums must not confine themselves to showing us pictures and objects from the past; they must also convey the ambiance of the lost time from which those objects have come to us. And this can only happen through personal stories. The newly reopened Rijksmuseum in Amsterdam, for example, is a dazzling demonstration of the sophistication of Dutch culture and collecting, and of the creativity of contemporary museum design. But only places like the small and equally innovative Anne Frank House can be like novels in their ability to make our hearts beat faster with the emotional depth of a personal story. When we visit larger, grander museums, it is always with a commentary, a historical explanation running in the backs of our minds. But small private museums are more open to individual stories. When I was little, I had no interest in museums. At the time, museums in Istanbul tended to look like cheerless government offices designed to exhibit and preserve archaeological artifacts, and the leftover splendors of the Ottoman era. These were boring places, little more than storerooms. During the 1990s, around the time when my books began to get published in the West, the first places I went to on my travels outside Istanbul were major museums like the Louvre, the British Museum, the Metropolitan Museum of Art and the State Hermitage. These massive and highly symbolic institutions did, of course, convey a sense of the creative energy and the wealth of history behind them. But it was only in the smaller museums that I was able to find the fragile histories of individual human beings, to experience the pleasures of that depth of meaning that results from the connection between objects and personal dramas and to feel that metaphysical sense of time that museums must be able to convey. There is also a political side to the matter. Turning the Louvre from a private residence of the Bourbon royalty to a national museum for the people of France was a liberating transformation, both from a cultural and from a political point of view. This transformation had a democratic aspect, not unlike the move from epic histories describing the feats of kings to novels focusing on the lives of ordinary people. But in the more than 200 years that have passed since the Louvre’s conversion into a museum, these large state museums have turned from catalysts for greater freedom and democratization to tourist destinations acting as symbols of state and national power. The massive, Louvre-like state museums that are being set up, at great expense, in non-Western cities like Beijing and Abu Dhabi, where individual rights and freedom of thought are often suppressed, do nothing to nurture the efforts of local artists and individuals. Instead, these monumental new structures seem to crush the area around them, overwhelming the nearby neighborhoods and the city itself, and acting as smokescreens for the crimes of authoritarian regimes. The economic growth that we have witnessed in non-Western countries over the past 20 years has brought with it the formation of a middle class. 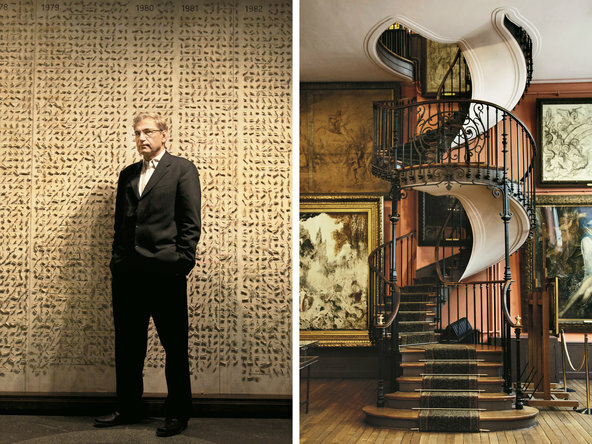 In order to experience the personal stories that come from within these emerging, modern middle classes, what we need are not huge state museums, but small and innovative museums focusing on individuals. The ingenious developments we’ve seen in museums, in regard to curating and architecture over the past 20 years, can turn small museums into wonderful tools through which to investigate and express our shared humanity. 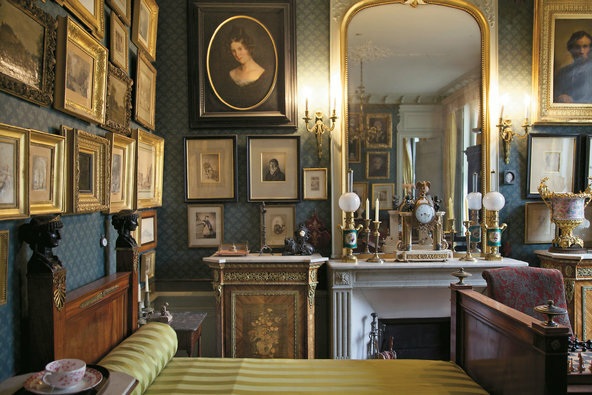 The walls of the Moreau‘s bedroom are lined with family portraits, including one of Moreau by Edgar Degas.